This post is the first in a series of interviews with fabulous and interesting perfume lovers in our fragrance community. I’d like to focus on people who haven’t been interviewed already, so not the perfumers, but the people we all love to hang out with online because of our shared interests. You may know Melissa Groben from having a generous swap with her, or reading her writing on The Pefume Magazine, or chatting with her on boards/blogs, or seeing her new jewelry creations on FaceBook and Etsy. In addition to knowing her in these respects, she has also been a scent tester for me, and I’ve appreciated her input very much. Here she tells us why fragrance has been so important in her life, how she found the online fragrance community, how she started her new jewelry business called Barking Acres Studio, and a little about her family and home background. I think many of us will relate to aspects of her story, though there are several extraordinary aspects that few of us probably share. She’s always been warm, friendly, and helpful, and I hope you enjoy getting to know her better! How has fragrance affected your life? What role has it played? I was about 11 years old when I started to lose my hearing. I couldn’t hear birds anymore. I couldn’t hear music anymore, except for the deep bass sounds of drums. I got through college (with high honors to boot) by memorizing all my textbooks rather than relying on lectures because I couldn’t hear the professors unless I could read their lips. By the time I was in my thirties, I had no more high frequency hearing and very little low frequency left. I’ve always been crazy for perfume. 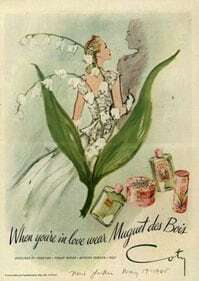 As a young pre-adolescent, I would treat myself to Muguet des Bois and Jean Nate every Spring to welcome in the new season. Perfume has always filled the huge void that deafness left in my life. It colors everything for me, the gardens in the summer, the holiday scents and cold air of the winter, the Autumn smells of leaves and smoke. Fragrance really is the background music for each day. As I met more and more perfume people online, perfume began to broaden my horizon, introducing me to people all over the world, the most generous group of individuals I have ever known. What was the first online fragrance group that you discovered, and was it the first time you’d found others with the same interest? The first group of people that I met online was the famous MakeUpAlley. I was teaching environmental science classes for children at Long Island’s Cornell Farm and was asked to design a Mother/Child class on making scented lotions using the herbs grown on the farm. I started researching scented projects and that led me to MakeUpAlley. Yes, it was the first time I ever realized fragrance could mean so much to other people. MUA led me to all the wonderful perfume blogs and the communities of people who follow them. I was really shocked that others loved perfume the way I did! You have been a tester for me, and I know you have tested mods for other brands too. Without naming anyone, do you find that we do things very differently? Do you enjoy the testing process? I absolutely adore testing perfumes. I feel so honored to be part of the process. I think it is so fascinating to watch a scent developing but what really surprises me is how I can think a scent is ready and you will say you feel you need to add something, and sure enough, you make it even better. I think the one perfume that I felt most honored to help you with was the retro chypre Nostalgie. To go from testing over and over and then to see the perfume bottled and up for sale is just a miracle! I do test for some others, and I think much of the process is the same, but you tend to let me participate at an earlier stage than some other perfumers do. When I see some of the perfumes bring in raves, I always feel like part of me went into making that scent! From what I’ve read, it sounds like you grew up in a family of creative people. Can you tell us a little about that? I grew up in a very, shall we say different, type of home than most. Of course I had no idea our home was different until I reached adulthood, but I never really felt comfortable in other more traditional homes of my friends. My father was Joe Simon, the other half of Simon and Kirby of comic book fame. 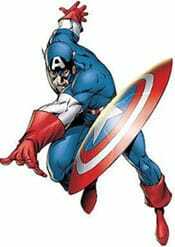 My father is best known for creating Captain America and for creating the Young Love comic books that gave women their own genre in comic book history. Dad had his studio right at home and two days a week would head off to his Manhattan publishing offices. His studio was always open to us, nothing was ever forbidden to us. I think between my hearing loss and being so close to my father, my visual abilities were always being exercised and expanded. I was very close to my father. I would spend hours with him in his studio, enduring the thick clouds of cigar smoke and the blaring television, while he worked at his drawing board. He would let me use any of the materials in his studio. He taught me how to develop photo film in our home photo darkroom. My Uncle Jack Oleck was a published novelist who often helped script some of the comic book stories and later, Sick Magazine, a magazine of political satire that my father created. I was often taken along to Harvey Studios (home of Casper and friends), so I was always exposed to writing and illustration etc. I can still remember the scent of my father’s paints mingling with the cigar smoke, and it meant total comfort for me. We had lots of animals, always several dogs, cats, flocks of chickens and ducks, and tons of other kids coming in and out of the house. It was a very idyllic way of being raised, in many ways, with animals and woods outside, and books and art all over the house. Of course, my father was the biggest kid, who just happened to make a lot of money with his art and writing! I have always felt the need to create. I can actually feel it in my fingers when the need arises. I used to write when I was a child, and in my twenties and thirties I began to sew and quilt a lot. Quilting really trained my eye to see color and understand how pieces could go together to form something totally different from the pieces themselves. Then my sister introduced me to Sundance Jewelry catalog, and I really loved the styles they offered. Very earthy, environmental, and simple. One day I decided to see if I could do something with that bag of supplies. I looked on youtube and tried a few very simple things and was able to pull them off. Shortly after this, a darling perfumista who we all know and love, Ruth K, helped me with simple instructions and steered me in the right direction for getting quality supplies. And another perfume friend, Tamsin S (whom I call my “sister”), loved my designs and made me feel that I could put my designs out there so that others could enjoy them. It all took off from there, from perfume, and from the people who shared their kindness and generosity with me. How wonderful is that! What are some of your favorite jewelry materials to work with? I love working with real gemstones! Actually, I love working with the more rugged versions of the gemstones sold in jewelry stores, but I am not sure if others would actually want to wear those items as jewelry. I have beach stones and glass from Long Island beaches that I plan to incorporate into some pieces. I don’t like working with inexpensive, artificial things like faux pearls or fake stones. Why use fake when you can use the real thing? You may spend a bit more money, you may have to search a bit harder, but what you make is all real. Last weekend I started to move into designing an entire pendant from scratch, from the wire to the gems to hammering the wire. Hammered metal is a whole different artistic look than the stuff you find in a store. Most of my designs are based on nature, what I see around me every day, especially here in this beautiful part of the country. My jewelry is really what I would love to wear: it may not be for most people, nor for the mass crowds of shoppers, but it is created from inside my own head with materials that send me into endorphin heaven! Having a daughter is a great thing too. I can’t tell you how many times I start out thinking, “I’ll make this for Emily Jane,” and so many other people fall in love with it that I end up offering it to everyone. I was really impressed to see that in addition to jewelry, you make quilts. I love quilts! What kind do you make and how did you learn? I’ve been quilting since the mid-seventies. I really love the old fashioned patchwork quilts, the ones that are based on simplest designs and were meant to be used, not displayed. I am not very fond of modern quilts or even machine made quilts. I do put together the pieces on my machine, but I do the quilting designs by hand. How did I learn this? For a year I lived in a small town in Texas (Sanger, Texas). My neighbor was a real authentic Texas quilter who used up all the clothes and rags in her home for quilts. They were beautiful! She began to teach me how to quilt, and I learned more from books, and I read and read. This was way before computers and youtube instruction. It was very hard to find quilt supplies, or teachers, or even quilt groups unless you were invited by another quilter. So, like everything else I ever did, I am self-taught. Can you tell us about the four legged friends that inspired the name of your jewelry business, Barking Acres Studio, and how the name came about? The name actually came about by accident and through a sort of personal joke with my husband. I have a 10 year old Brittany, my velcro dog who is always within 5 feet of me. Five years ago my husband and I moved to the Finger Lakes and bought our home with its land surrounded by farmland and woods. 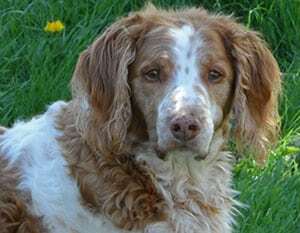 Boomer, my Brittany, of course would bark at the deer and foxes and coyotes he saw passing through the property, and my husband began to refer to our home as Barking Acres. We would be out doing chores, and he would say, let’s go back to Barking Acres, and after a while, the family began to call our home Barking Acres, and before we knew it, the name stuck! It was such a funny name that we couldn’t help but laugh each time we said it. Since my studio is in my home, I decided to carry it one step further and name the business Barking Acres Studio. Pretty soon I will be starting a blog called The Slow Dog Blog from Barking Acres, also an ode to our old Brittany who forces us to now walk as slowly as he does in his old age, and that’s pretty damn slow! I thought: slow family, slow food, slow dog, why not a blog called The Slow Dog, all about taking your own slow time to enjoy each moment you can? The photos you’ve posted on FB of your home, garden, and locale look gorgeous and must bring you a lot of pleasure. Did you grow up in the same area? Thank you for the compliments on my home and garden pics! I love living here. I grew up on Long Island, first in Nassau County and then in Suffolk County. I have always loved woods and land. When I was a child we were allowed free rein to go anywhere, like most kids on Long Island were back then. I would spend whole days in the woods, armed with my little pocket books of Wild Flowers or Rocks and Minerals! Just 5 years ago, Mike and I moved to Barking Acres (there is that name again!). I love it here. 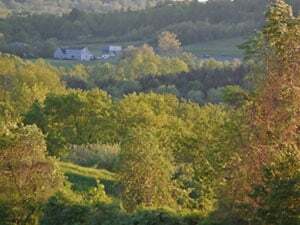 We live in a small farmtown about 30 minutes west of Syracuse, surrounded by farms, lakes, rivers, and drumlins (huge hills carved out of the land by the glaciers). The seasons here are phenomenal, each one distinct from the other. I often say I feel like I am living in a children’s coloring book! The visuals that nature offers us, for free, up here are astounding. I can understand why the Native Americans were so spiritual after the beauty that surrounds us. Looks like you do quite a bit of gardening! What are some of your favorite plants? I started gardening when my two kids were toddlers. At that time I lived on Long Island, in a regular development like most Americans live. I wanted to create a park-like setting for my kids on our own property. I started to learn and read about gardening (again, pretty much self-taught!). Eventually, our property had a hollyhock garden the children used to hide in, and a perennial garden that was situated right behind their swing set so they would swing up over the perennials. I would place a children’s picnic bench hidden underneath a flowering shrub so they were partially hidden in their own little worlds. It was a lot of fun designing a magical place for the kids. 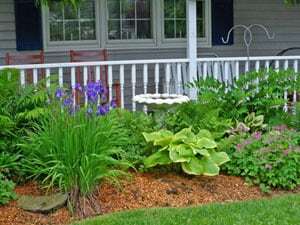 Living up at Barking Acres, I have continued perennial gardening, with a woodsy type garden directly in front of my front porch (north facing), and colorful sun loving perennials on the hot side of the house. I have two favorite plants: daffodils and beebalm. Daffodils always come up right when we need them the most, at the very beginning of Springtime and want nothing more than a place to grow. Bee balm, which also is a carefree plant that thrives anywhere here, offers itself to all bees and butterflies and gives us a gorgeous dark red flower wherever we plant it. And also, of course, blue morning glories, the color of which I believe no artist paints could ever match. Thanks so much for your interview, Melissa! We share a love of fragrance, nature, animals, gardening, and artisan jewelry, so I feel a kinship in those ways, and we both appreciate all the special people we’ve met through the fragrance community. It was fun to get a peek into your world! I was touched when I read Melissa lost her hearing when she was young. But by the answers she has given I feel she’s a wonderful person. She has a passion and she does what she loves – that is the important thing in ones love, to be passionate and feel good about your job. Hi Lucas! Yes, it’s a blessing to be able to do things you love. Glad you are on that path too! 🙂 And I can imagine how losing your hearing would make the other senses that much more important in your life. Lol! We have lots of people in our group that seem fabulous and interesting to me! Thanks for being such a great first subject and for sharing your story! Melissa, you are so talented! This was a terrific interview! Indeed, she is, Jim! Glad you enjoyed the interview! What a great idea, Laurie – and a lovely beginning! Melissa – It’s so very nice to “meet” you! Glad you enjoyed the interview, Lynette! Looks like you are a quilter too! Lovely story about a lovely lady I first ‘met’ on MUA. We had a ‘velcro’ Brittany too, Melissa, will look forward to your new blog. Wonderful article about a wonderful lady! I have one request. I didn’t see a link to her jewelry online? Would it be possible to post it? Thanks! 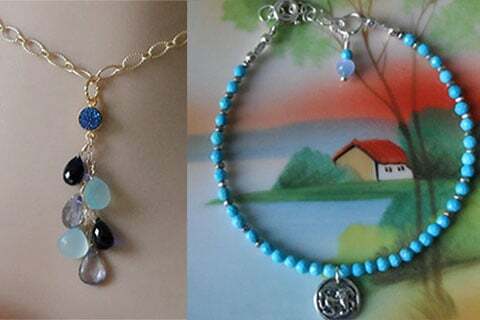 If Melissa has another link I hope she’ll post it here, but I don’t think she has a website yet, so she’s using that Facebook page to post her designs. This was a great idea Laurie. I was excited when I read in your updates that you would be doing this! What a great interview Melissa. Your story was so interesting. The story about the garden you made for your young children was touching. Our little ones so need to be in touch with outdoors and nature. It was great from beginning to end!! Thank you. I’m not connected to facebook but would also love to see your jewelry designs! Last thing MUA was one of the greatest discoveries for me. I had no idea at the time there was a whole wonderful community of people like me with the same love of fragrance. I’ve met the best people there. As always Laurie I think you’re amazing!! Glad you enjoyed it, Beth! 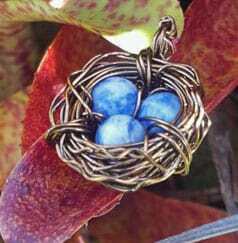 The two pictures above are two bird-themed pendants that Melissa makes (the bird’s nest with eggs comes in a variety of color combos, but I love the blue lapis eggs in that one). So many fragrance lovers have found each other online through MUA! I think it’s a common thread for a lot of us, though these days there are enough blogs that people find the fragrance community through blogs as well as boards. Laurie, thank you so very much for the lovely interview. It was a blast! Love this, Laurie! And Melissa, what a beautiful life you’ve created for yourself and your family. I am thoroughly inspired. Take care. I think Melissa’s story is inspiring too! And I love how we are all connected. 🙂 Thanks for stopping by, Robin! Your interview series is a great idea, Laurie. Yes, we know the perfumers, the bloggers, but it’s great to meet the non-blogging perfume lovers! What a lovely series Laurie. And Melissa seems like a wonderful, warm interesting person. I think it is a great idea to interview perfume lovers (who don’t necessarily blog). Thanks, Lavanya! I need to get back to the next installment. This first one was fun!